To make room for more thought provoking content, we are excited to formally transition this blog to Keynote’s “Mobility” blog. Start reading today on the latest thought leadership from DeviceAnywhere and Keynote, providing the largest product line covering the industry’s testing and performance needs. 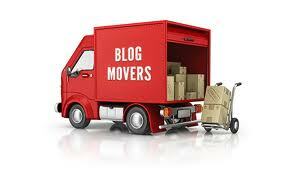 If you are currently a follower of this blog you will need to ‘re-follow”to get up-to-date content from DeviceAnywhere. We encourage you to register today here! In a recent article written by Stephanie Blanchard, she discussed Mozillas plans for it’s web-centric approach to supporting mobile. In the article she writes “Back when Microsoft’s Internet Explorer dominated the desktop, Mozilla, an offshoot of Netscape, decided to challenge the monopoly with an open-source browser. After all, the non-profit organization’s core values revolve around one concept — the Web is a common good for society, not to be controlled by one or two companies. After several Beta versions, Firefox was introduced in 2004. The browser attracted 100 million global users within its first year. Today, Firefox products (including Firefox for Android) account for almost half a billion users around the world. With the new mobile OS, which debuted at this year’s Mobile World Congress (MWC), Mozilla’s calling is once again to “free the internet, to create a common set of standards across all devices,” and to “unlock mobile” by giving users a viable option. “We are fundamentally in the same place we were over a decade ago where it’s being unnaturally controlled by a few parties,” said Gary Kovacs, CEO, Mozilla, at MWC. Indeed, Apple and Android account for the bulk of smartphones, with Windows and BlackBerry fighting for third, or what many industry analysts consider crumbs. Not surprisingly, Mozilla takes a web-centric approach when it comes to mobile. HTML5 apps exist as a “first class citizen” on the homescreen. Similar to Android, Firefox OS is based on Linux. It runs the Gecko engine for its user interface, with more than 40% of its code written by volunteers. Although Mozilla expects to continue to attract followers, especially as two billion new users come online within the next five years, the organization says it is not driven by profits, at all. Instead, it wants to be a much-needed catalyst in the mobile space, providing enabling technologies. John Jackson, Research Vice President, Mobile & Connected Platforms., IDC, concurs. In 2011, one-third of Americans owned a smartphone. That turned into one-half just a year later. According to the recent iPass Global Mobile Workforce Report, more than 62% of employees now use a personal smartphone for work, a trend that is expected to grow. Despite Kovacs’ statement of the altruistic mission of Mozilla’s smartphone strategy, there is still a possibility that phones will eventually find their way into the enterprise via BYOD. Mozilla will likely aggressively focus on converting the remaining simple handset users to its inexpensive device. As more and more devices are introduced with the Mozilla browser pre-installed the use of HTML5 web apps and hybrid apps will grow exponentially. When utilizing the DeviceAnywhere platform it is important to remember that our devices come with whatever comes pre-installed on the device. Many devices may or may not have Mozilla or be HTML5 enabled so feel free to ask your rep or sign up today for a free trial! Mobile website development is becoming more critical for businesses as the demand for smartphones and tablets grows and becomes more commonplace. The 2012 -13 World Quality Report (WQR) reveals that a majority of developers and QA professionals are skimping on important steps in the mobile testing process in order to rush their mobile apps and websites to market to meet truncated deadlines. Many development teams are feeling the pain that occurs with the demand of high output and quick product deadlines. However, they may not have the right tools for effective mobile testing and QA, if at all. Many businesses are expanding their mobile development without adding headcount; therefore it is important to the bottom line that they increase workflow efficiency and productivity. 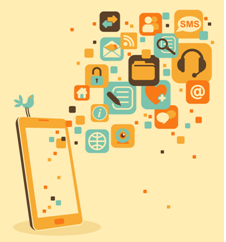 The adoption of mobile brings on new challenges for development and QA teams. According the WQR, when QA testers and developers from a variety of industry sectors were asked if mobile app testing is a regular process in their development stage, answers for yes ranged between the 20-30th percentile. It is clear that there is a lack in regular testing in the development stage .For mobile initiatives to be successful, teams must be armed with the right tools and methods to properly test and troubleshoot mobile apps and websites. 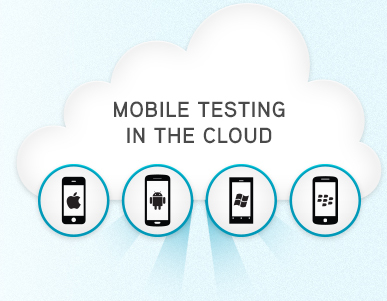 Try out our new free mobile web testing platform – DeviceAnywhere Free NOW! Wave of New Mobile Devices Complicates the Delivery of Optimal Mobile Experience – Keynote to the Rescue! Feb. 25, 2013– Keynote® (NASDAQ: KEYN), the global leader in Internet and mobile cloud testing and monitoring, today announced device support for iOS 6, Android 4.2 (Jelly Bean) and Windows 8 devices with its DeviceAnywhere platform. The newest additions to the Keynote device portfolio extend the company’s position as the market leader in devices supported for real mobile device testing. DeviceAnywhere support now includes the newest popular devices including the iPhone 5, Nokia Lumia 920 and the Droid RAZR M.
Delivering a consistent high-quality mobile experience continues to be a major challenge for companies interested in reaching a diverse universe of mobile users. Keeping up with the continually evolving device ecosystem presents some of the biggest challenges facing QA teams. While the number of operating systems and OEM device manufacturers are shrinking, device fragmentation continues to be a big issue. 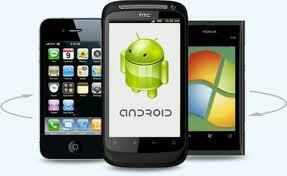 Testers new to mobile quickly realize that one Android device may behave quite differently than the next. 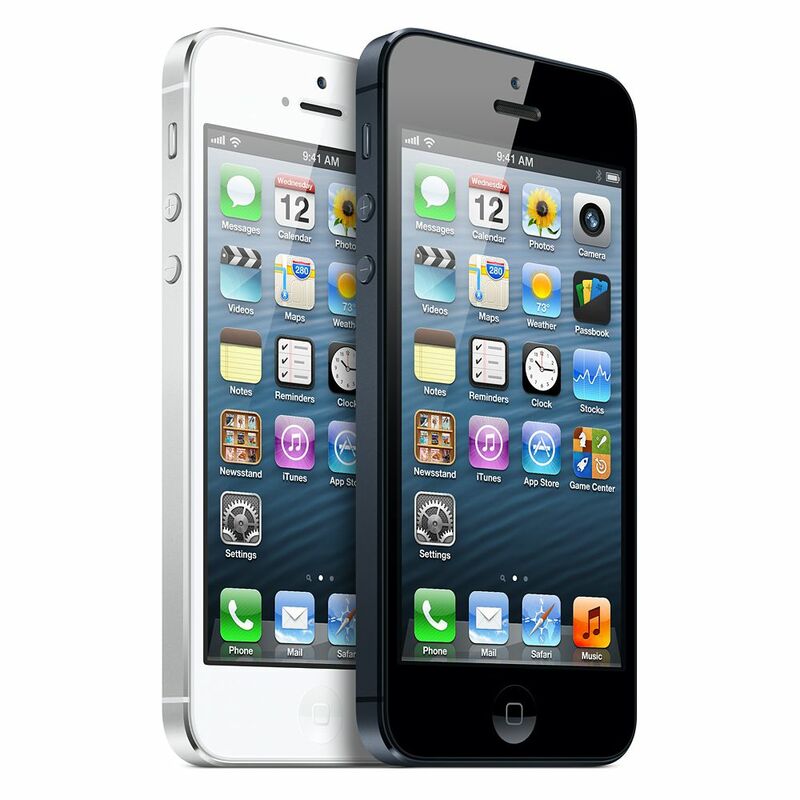 Meanwhile, Apple has introduced new form factors for their iOS devices with the introduction of iPhone 5 and iPad mini. 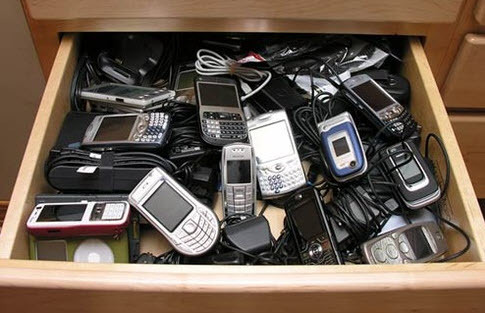 As new Windows 8 and BlackBerry OS devices also hit the market, device fragmentation adds an additional layer of complexity to mobile development. By adding the most up-to-date mobile devices to the DeviceAnywhere library, Keynote helps testers keep up with the changing mobile landscape, while maintaining the flexibility needed to address future changes. All existing Keynote DeviceAnywhere customers will have access to the newly supported devices from all products including: DeviceAnywhere Test Center Developer®, DeviceAnywhere TCE Interactive®, DeviceAnywhere TCE Automation® and DeviceAnywhere TCE Monitoring®. 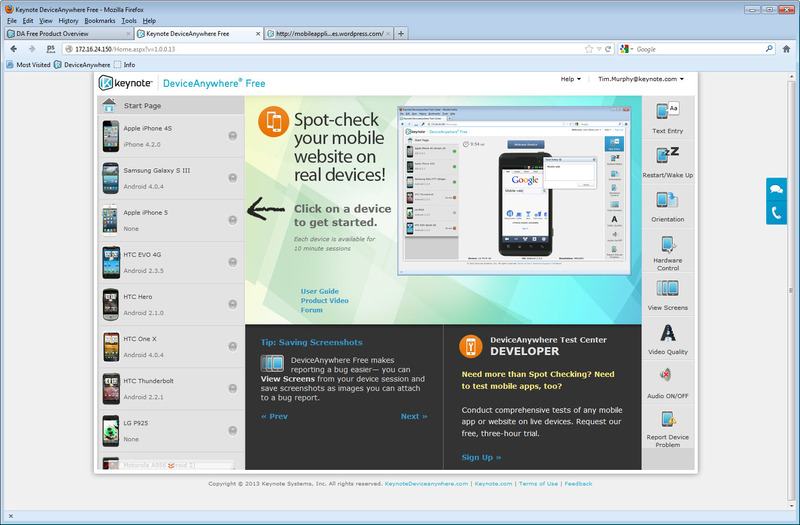 Keynote also recently introduced DeviceAnywhere Free, the first completely free tool for remote, real device interactive testing; giving users a real-time view of their mobile websites on select smartphones via a streamlined Web interface. When a user’s needs surpasses basic spot-checking, Keynote’s Test Center Developer and Test Center Enterprise provide a seamless upgrade path to fully test mobile websites and applications. Keynote® (Nasdaq: KEYN), the global leader in Internet and mobile cloud testing & monitoring, today announced that BBVA Compass, one of the 15 largest banks in the United States with a leading franchise in the Sunbelt region, has selected Keynote’s DeviceAnywhere platform. 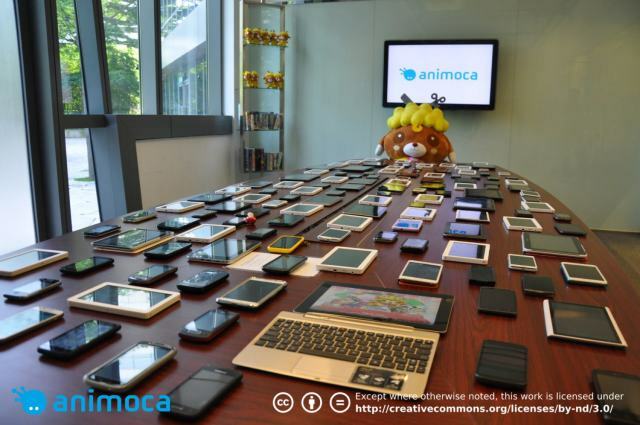 BBVA Compass uses DeviceAnywhere to test its rapidly growing portfolio of mobile apps with a large number of mobile devices during the development process to ensure a high level of customer satisfaction in a cost effective manner. With the DeviceAnywhere platform, companies have the ability to access hundreds of real mobile devices including iOS, Android, Windows, and BlackBerry devices from anywhere in the world. Companies can also utilize a free tool (Test Case Manager) to build, manage, and maintain their test cases all in one, convenient location. BBVA Compass developed many test cases using the Test Case Manager tool within DeviceAnywhere allowing their team members to capture results for review. These test cases allow them to examine functionality such as checking account balances, looking up transaction histories, paying bills and transferring funds between accounts. Developers also perform ad hoc testing by going through varying sequences of opening windows and tasks to identify the source of errors that occur on one version of a device but not another. In the near future, BBVA Compass plans to expand its use of DeviceAnywhere to its customer service centers. By making available hundreds of mobile devices to customer service agents from all over the U.S. through the Internet, agents will be able to test apps using the same devices customers use so they can replicate what the customer sees and more quickly troubleshoot problems. 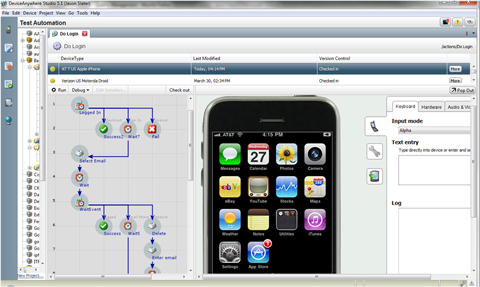 Miss our Webinar on How to Extend your Existing IBM RQM Environment to Mobile? VIEW NOW ONLINE! What if you could effectively manage the cost and complexity of your mobile application testing without compromising the quality of the result? An effective mobile application testing strategy that uses real devices while leveraging your existing test environment and testing methods—including manual testing, automated testing, and continuous monitoring—can help deliver better results.IBM’s mobile app testing strategy works by combining multiple testing techniques and utilizing specialized techniques and services from IBM partners, such as Keynote. Keynote’s DeviceAnywhere platform enables mobile app and website testing on real devices, helping to improve quality of your mobile applications while accelerating your test process and making it cost-effective. We invite you to join us for this exciting webinar focused on mobile app and website testing, all from within the IBM Rational Quality Manager platform! iPhone 5 Now Available for Testing on DeviceAnywhere! 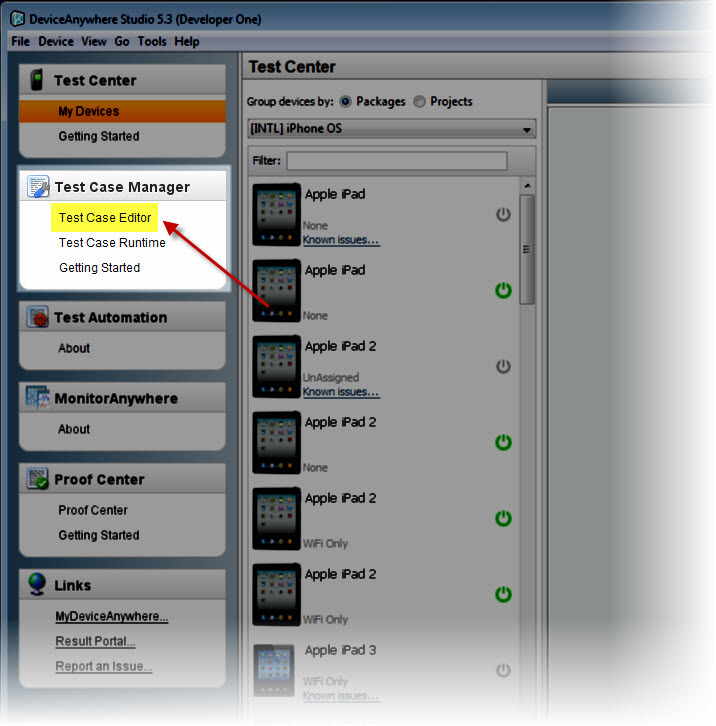 We are proud to announce the support of the iPhone 5 (with iOS 6.0) on all of our product lines including Test Center Developer, as well as for our enterprise customers. It is also included in our new free offering – DeviceAnywhere Free! Our iPhone 5 devices are full-hardware integrated devices and are NOT jailbroken – giving you the exact, pixel-for-pixel experience as if you had the device in your hand! So, don’t delay…. for free mobile website testing get started now! For free mobile app testing with upload ability, go here to request a free, no-obligation, 3 hour trial! 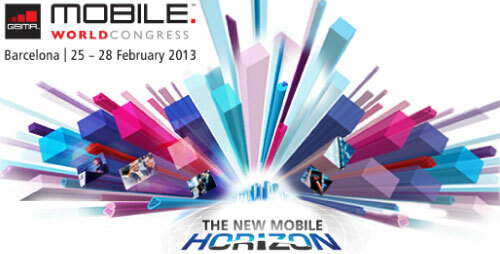 Mobile World Congress 2013 – Focus on LTE and New Devices! The agenda for this previously announced mobile event in Barcelona on February 25 – 28 has been published. (Come see us at our booth # 6C71!). Several sessions deal with Long Term Evolution and a panel discusses challenges the industry is now facing around LTE network deployment. In online publications and from big consultancies there’s more on the topic. One article in the German publication c’t summarizes what fourth generation mobile communications can accomplish. In addition, Deloitte has published its study “Technology, Media & Telecommunications Predictions 2013″, parts of which also cover LTE. Bottom line: LTE is growing and here to stay. Until the end of 2013 over 200 mobile providers in 75 countries will offer LTE-services. Most recent addition in Europe is Orange in France – after competitor SFR joined late in 2012. In Germany, Deutsche Telekom, Vodafone and Telefonica/O2 offer LTE services, while ePlus is still testing. In terms of marketing, a key question for Deloitte is how best to differentiate 3G and 4G. Operators need to strike a balance between underwhelming and overselling, as there may not be any single new killer app in 4G, which 3G cannot deliver. What will differ markedly, however, is user experience, and as a result duration and intensity of usage. This combination entails that for the increased data that will be transferred, Web pages and apps need more meticulous programming and even more custom tailoring to the available devices. Extensive testing will lead to an increase in quality and also will work as a differentiator. An estimated 300 devices (smart phones, tablets und dongles) will be on the market by the end of this year. Looking at smart phones only, Apple and Samsung are hard to beat – c’t also mentions HTC One XL from Taiwan as one of the players in the field. But competitors think on their feet and two of them currently work vigorously on their comeback. Nokia – one of the sponsors at the Mobile World Congress in February – is back in the black. The company gave up its own operating system Symbian and now relies on Windows in its attempt to catch up with its competitors. Microsoft in particular has put its focus on the mobile market in striking such a partnership. 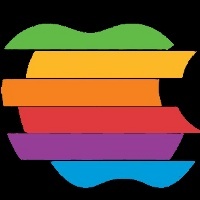 The company is still to be counted on, especially in the enterprise segment, where it always had a strong presence. The quoted article points to an additional report, which highlights the new partnerships Microsoft has entered into: There’s Nokia for mobile apps, YELP supporting local searching and also Barnes & Nobles in e-reading und mobile devices. Its headline is strong: “Microsoft is raising an army” – alluding to the company arming itself against the key players in the market: Amazon and Apple. Research in Motion is aware that this is their last chance in the mobile market. Today they are launching their new Blackberry 10 (IDC Analyst Ramon Llamas: “RIM is betting the farm…”). Historically, RIM was never the most developer-friendly platform and is now planning a 180-degree turn around in offering 70.000 apps on its Blackberry 10. 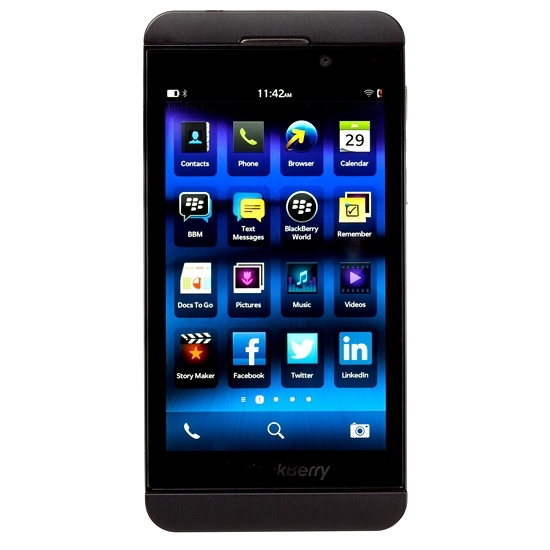 The company pursues this goal aggressively in promising 10.000 USD during the first year of BB10 to each developer. Its huge installed base will come in handy when tackling this task. Today, Research In Motion Ltd announced it is changing its name to BlackBerry, the company announced on Wednesday, in move to refresh its tarnished image as it begins marketing a re-engineered line of BlackBerry 10 smartphones. Looking at the big picture, it will be hard to catch up with Android and Apple by their sheer volume. Differentiation will be the name of the game and this will most probably not be decided by the number of apps a provider can push to market. According to the recent 2012 -13 World Quality Report (WQR) “We were surprised by the relatively low level of proactive structured testing in this increasingly essential area of business connectivity. We believe that mobile testing needs to be a fully integrated element of the QA discipline, so that the mobile strategy of the enterprise takes testing into account right from the start. The strategy should consider the objectives of the business owner, how the mobile app is delivered, and the target user for the app whether that be customers, suppliers, or employees. Organizations need to accept the paradigm shift brought about by mobility and embrace the new notion of quality for mobile apps, which is a departure from traditional standards applied to desktop applications. Of course you may expect this from a mobile testing platform, but our customers are continuing to see the value of having a testing strategy as part of their mobility rollouts. This includes planning, testing, automating, and monitoring their apps and services resulting in a shift in their understanding to see it as a need-to-have as opposed to a nice-to-have. Especially enterprise organizations who are investing millions in building out a successful mobile strategy to generate immediate revenue for their bottom line can’t afford to take that risk. There is too much on the line. As the report illustrated the user experience will be king and there’s no better way to test that experience than on a real mobile device. Companies around the world are facing the same issues when it comes to deploying their assets to the mobile platform. And one of the most prevalent issues is that of testing. As there are many types of testing, from functional (including BAT and UAT) to performance. Unlike a pc-based app, mobile apps and websites require a unique approach to meeting the requirements and demands of management and make their app a success in the market with adoption and a consistent new revenue stream. According to the recent 2012 -13 World Quality Report (WQR) in their previous surveys they have “focused attention on the difference between the major countries or regions surveyed. This year they noticed that while variances still exist, there is a greater harmonization, with fewer major differences evidenced across the globe, at least within the enterprise markets. One example is that the proportion of an organization’s software development lifecycle budget that is investing in testing (including mobile) averaged across the regions, is 18%, with remarkable few regional variations. 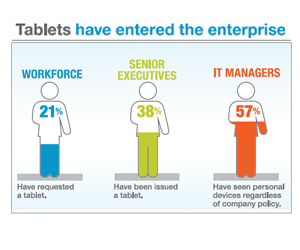 The Next Tablet Frontier: Enterprise Apps? Rich Miner, a partner at Google Inc.’s venture-capital arm and a co-founder of the company’s Android mobile-operating system, said he expects to see a new “wave” of enterprise applications for tablets. Mr. 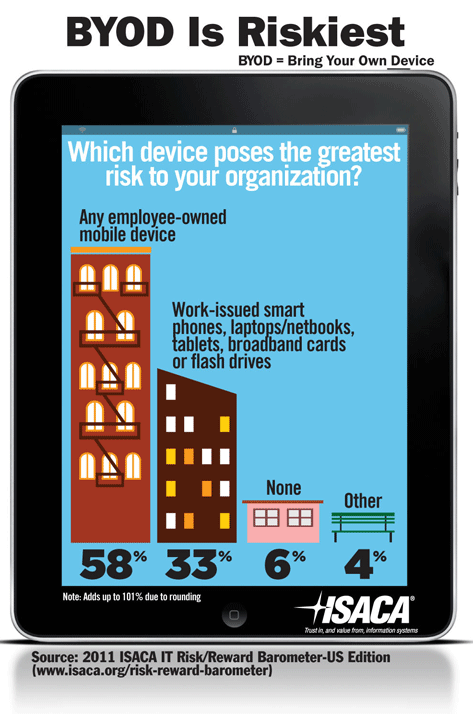 Miner said corporate CIOs are mastering mobile-device management and learning to safely use consumer apps like Dropbox. They are now ready for the “next level” of mobile applications that will reshape industries such as trucking and construction, he said. Can We Put a Price on Quality of our Mobile Apps and Websites? The quality of a mobile app or website is critical to the success of your business if it’s trying to monetize their existing assets on the mobile platform. It can be do or die for that app. 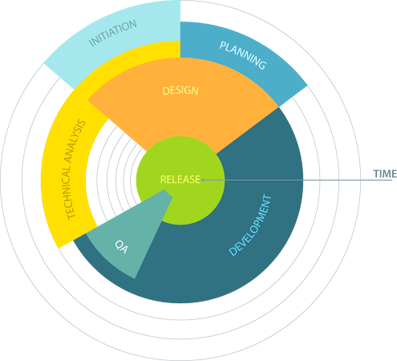 Therefore the importance of the QA team and management is vital to any companies mobile efforts. According to the recent 2012 -13 World Quality Report (WQR) “Technological innovations and initiatives are increasing the workload for ever-stretched QA teams, but the corresponding QA and testing budgets appear to be weathering the economic storms. In 2011, these budgets were not supporting the challenges faced in the marketplace, but this year’s survey (by WQR) finds testing budgets growing at a stronger rate than last year, with 42% reporting that budgets had risen over the past 12 months. While 18% forecast a fall when looking ahead to 2015, some 53% optimistically expect budgets to rise, indicating a new degree of confidence that the business is more committed to investing in QA. Moreover, the focus appears to have shifted from “business as usual” tasks to investment in transformational work, to drive enhancements, and 59% of the budget is now spent on customer-facing applications. So priorities are changing to support the core areas of the business that will require an optimized platform for efficient delivery of testing, which we regard as a positive step. 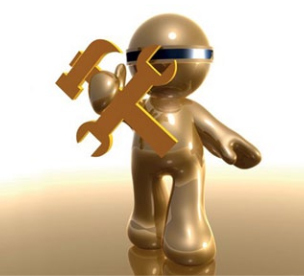 As I mentioned in a previous post, your QA team is a vital part of your development efforts. And can make/break your app’s quality. It was vital for web-based apps and is even more critical for mobile-based assets because of the vast complexity when it comes to deploying, testing, and monitoring their success. According to the recent 2012 -13 World Quality Report (WQR) “While budgets might be in reasonable shape, confidence in testing resources is not resounding. A majority of organizations characterize their internal teams as “average” at best, in their knowledge of core testing processes and methodologies, and not necessarily up to speed with the latest testing tools and technologies. Their assessment of external testers is slightly better, with a third of organizations scoring their external testers’ knowledge and abilities as “above average”. But less than 5% of firms are fully confident that their testers (internal or external) are “best in class”. Despite initiatives and investment, especially over the last decade or so, there are clearly lessons to be learned in terms of either real or perceived quality of output for both providers and users of QA. 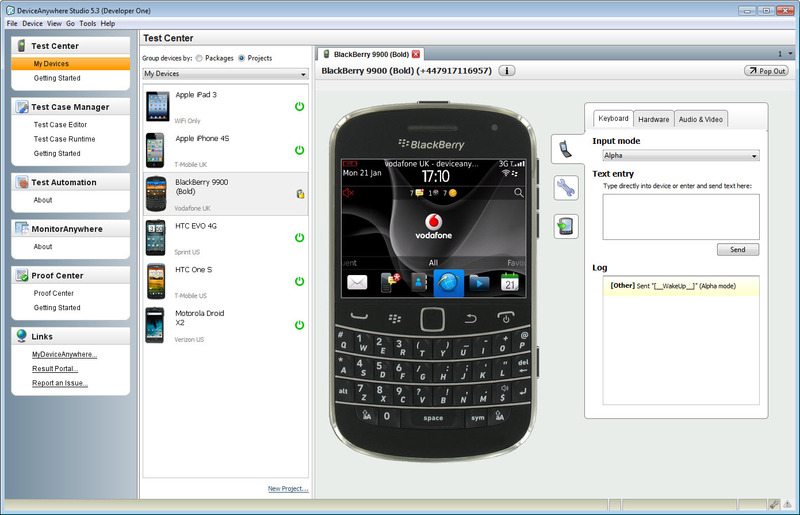 Test Center Developer supports hundreds of devices, at times making it challenging to choose and check out the models you need for your test cases. 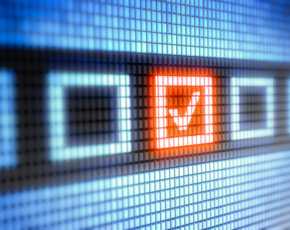 If there’s a set of devices that you typically like to test on, or if you have a specific target device list for a particular project, creating a custom device list view can be a real time-saver. 1. 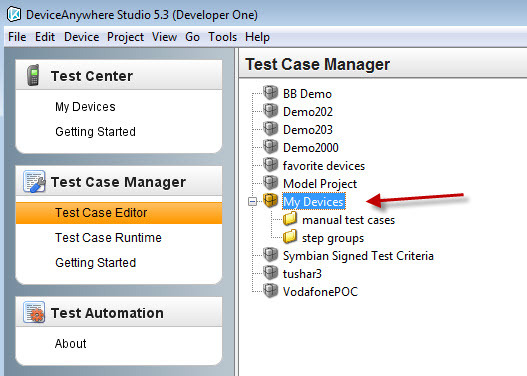 Click on the Test Case Editor tab under the Test Case Manager on the sidebar of DeviceAnywhere Studio (if you have minimized the sidebar, look for the wrench icon). 2. Click the New Project link at the bottom of your screen. 3. 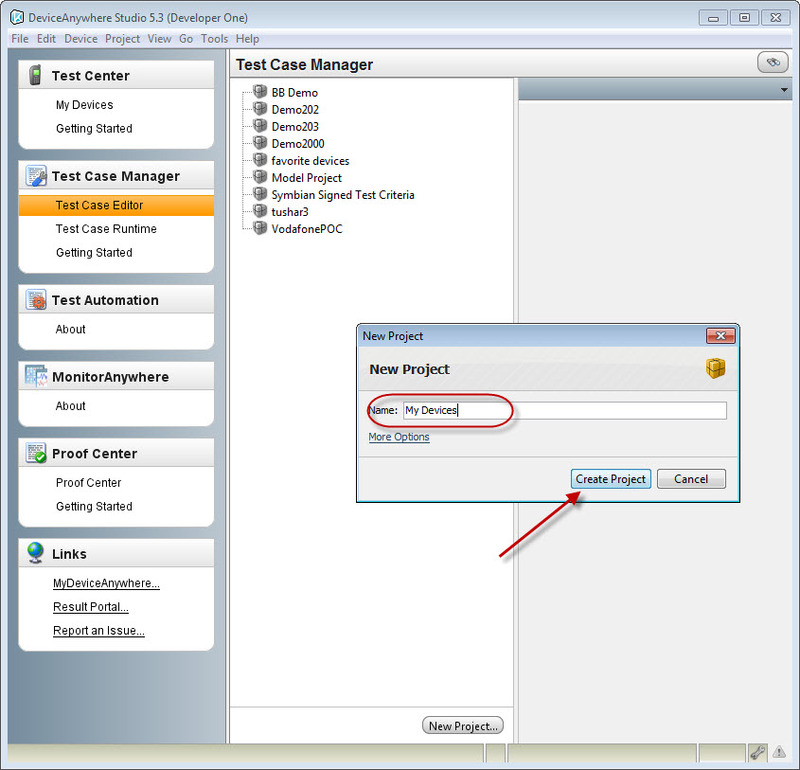 Name your new project, and select Create Project. This may take a few seconds. 4. 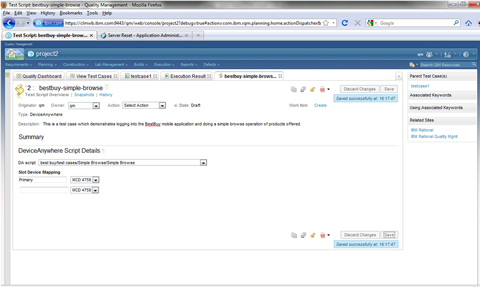 Once the project has been created, you will be prompted to add devices. Select all of the devices that you would like visible in your custom device view. 5. Now go back to the Test Center view. 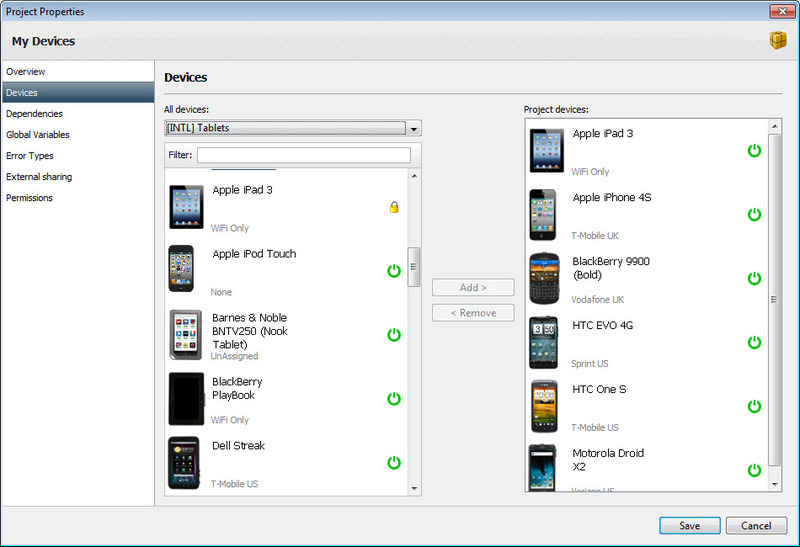 At the top of the device pane, select Group devices by: Projects. Your project will appear in the drop-down list and when selected, only the devices added to the project will be visible in the device pane. 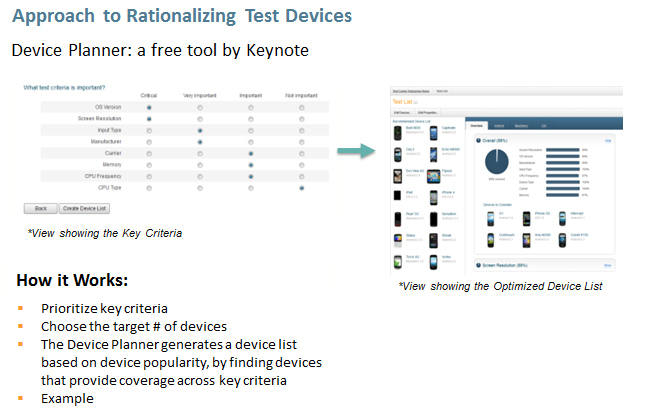 Acquire a device from your list and begin testing. You can create as many custom device views as you like following these same steps. Has QA Been Caught Off Guard by Mobility? QA managers and teams continue to struggle with how to handle the proliferation of mobility around the world in both consumers lives as well as behind enterprise corporate firewalls. This permeation has caused an unexpected demand for quality talent and experienced and skilled labor able to handle the onslaught. As the recent 2012 -13 World Quality Report (WQR) states “as mobile adoption has become almost ubiquitous in developed markets, the business imperative for mobile business is clear.” According to their study, it indicates that “speed of adoption and proliferation of handheld devices, coupled with the use of social media, seem to have caught enterprise testing by surprise. 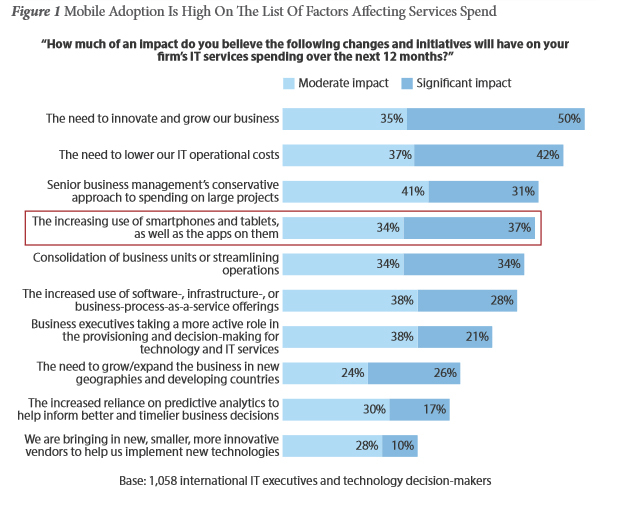 Organizations may not be giving mobile the priority it warrants. Only 31% of respondents across the world currently test mobile applications – a figure that does not deviate much from region to region, and those surveyed readily admit to being ill equipped for mobile testing. This suggests that QA has fallen behind the mainstream mobile curve. Reasons given are multiple: many report that they don’t have the ability to test or effectively certify mobile applications because of lack of appropriate tools, processes, or expertise, and limited access to the necessary devices. Moreover, the focus is firmly on efficiency of performance, cited by 64% of firms, rather than functionality, usability, or security. Overall, this argues for an underestimation of the infrastructure challenges posed by the mobile era, or an inability to address them. 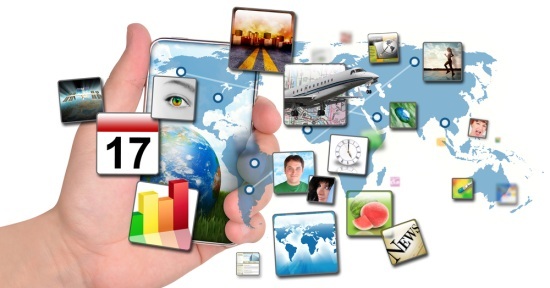 2013 is projected to see a continued exponential growth in mobile resulting in an immediate need to support efforts within enterprise organizations around the world to maintain and secure their infrastructure and protect vital resources. 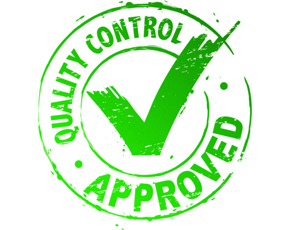 As a result “quality assurance is undergoing a quiet but steady evolution from in-house testing generalists to a structured and efficient discipline, with a greater influence within the overall application development lifecycle” as reported in the 2012 -13 World Quality Report (WQR). They continue by saying they “observed from their survey the emergence of a multifaceted discipline with an increasing range of operating models at its disposal, that enables a streamlined and cost-effective output that is also aligned with business needs. As more companies begin to go mobile and leveraging mobile apps for workplace productivity, mobile app testing will be a vital resource for mobile app developers. Testing mobile apps for bugs and performance issues ensures that the app will function as it’s intended to and will not crash or glitch when people use it. This is important because the purpose of developing an app is so people can buy and use it. The more people that use it, the more revenue the developer gets. One bug or performance issue will result in bad reviews, ultimately driving users to other similar apps, leaving the glitchy app in the dust. 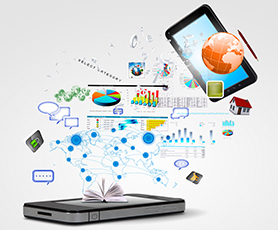 We’ll see a growth in mobile app testing in 2013 as more people rely on smart devices and subsequently, the apps on them, to accomplish personal and business tasks. In 2012, we saw an exponential increase in employees at companies bringing their personal mobile devices – including smartphones and tablets – to the workplace and using them to conduct business, whether by checking work email or accessing company data. This made it difficult for companies to manage company data, most of which is private information, and keep it from getting into the hands of people who shouldn’t have access to it. This trend deemed BYOD or bring-your-own-device, has luckily been addressed and most companies have found ways to manage these personal devices used for business. Now, employees are beginning to download apps onto their devices to help increase their efficiency and productivity at work. This includes apps which lets them access work data remotely or apps that connects them with customers and co-workers. The problem with this is that, after companies have gotten over the BYOD challenge, now they have to worry about the BYOA or bring-your-own-apps hump. In 2013, I predict that companies will rush to find a way to continue managing personal devices used for business, as well as going one step further to manage the apps on employees’ devices. DeviceAnywhere Free is now live! We’re bringing in the New Year with a bang by introducing DeviceAnywhere Free and marking a significant change to the mobile web testing marketplace. As the name implies, DeviceAnywhere Free requires no commitment on the part of the user and is a great way to learn about remote, real-device testing. Simply register and log in to our newly designed portal, and you’ll be able to see how your websites appear on real mobile devices. 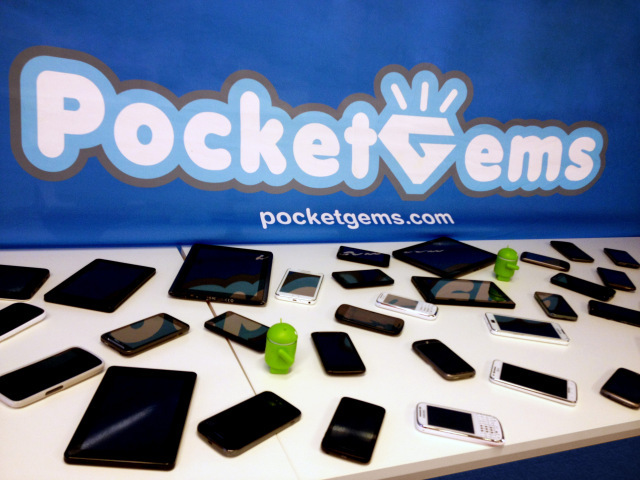 With the rapid proliferation of smartphones and tablets, mobile is hot. Yet mobile testing is still a relatively new and growing market. DeviceAnywhere Free will help the testing market catch up, giving users unlimited access to 10-minute website spot checking sessions. During a session, check out real, live mobile devices from the library and interact remotely with them to see exactly how website content looks and acts across a range of different mobile devices. Using the computer keyboard and mouse, a DeviceAnywhere Free lets you control the device, interacting with the touchscreen, device keyboard, and other device hardware. DeviceAnywhere Free supports tap & swipe gestures and invoking the accelerometer will put a device in landscape mode. There are also several utilities available to enhance productivity. 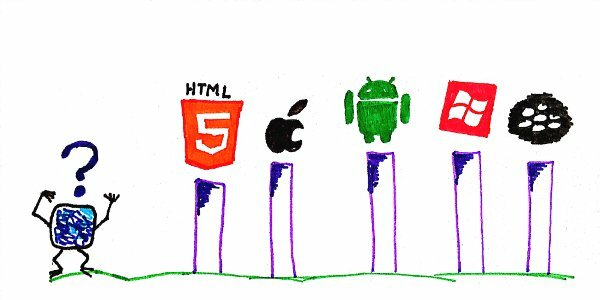 Today many developers, testers, and content owners depend on owned, real devices to access their website. This either means purchasing and maintaining a library or borrowing devices from friends and coworkers, or alternatively, simply not testing across as many devices for adequate test coverage. In a much more convenient environment, DeviceAnywhere Free provides access to some of the most popular smartphones on the market including the iPhone 5, Samsung Galaxy S3, the Nokia Lumia, and more. Quickly conduct spot checking on all of the major operating systems (iOS, Android, BlackBerry and Windows) and save screenshots to share with co-workers. They say that in the restaurant business the three most important words are 1) Location 2) Location 3) Location. 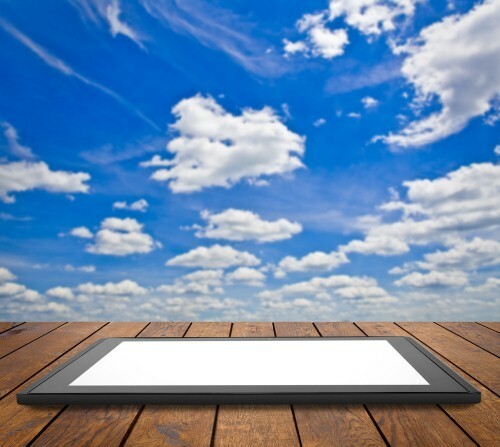 However when location is no longer important because the cloud lets you test from anywhere at any time, perhaps the words most important to you will be 1) Free 2) Free 3) Free. Get started today and find out. Welcome to 2013! Keynote’s DeviceAnywhere Platform Recognized with a SUPERSTAR Award! Once again, the #1 name in mobile testing has been recognized for it’s outstanding leadership and product innovation developed specifically for enterprises. Our HTML5 Web Testing feature as part of TCE Automation has garnered the Superstar Award this year in the Mobile Star Awards Enterprise Application Testing category. To learn more about the award and who we were competing against, click here! To learn more about HTML5 Web Testing, click here. Some retailers such as Boots are making strong efforts to follow mobile best practices and creating a pretty good experience for their customers. Others seem content to deliver their desktop site to the small screen and haven’t accounted for the needs of the mobile shopper. But even the best retailers in this study didn’t seem to be testing their website across enough devices to ensure that all shoppers enjoy the best possible mobile shopping experience. The problems we find would certainly not be tolerated on a desktop site. 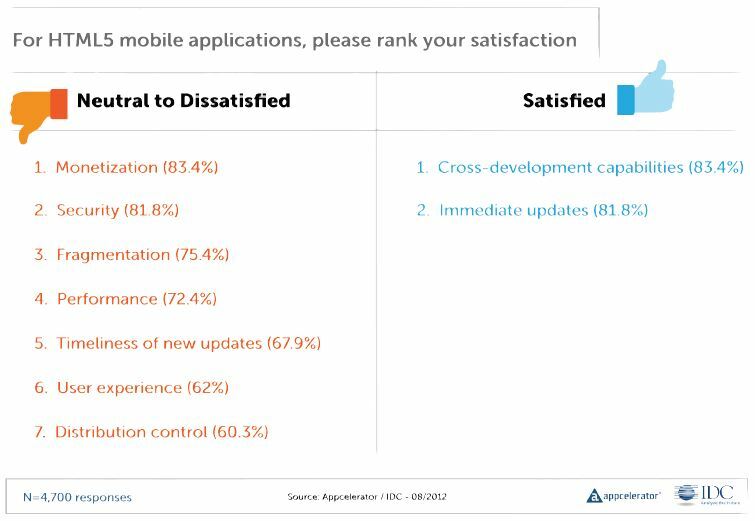 It’s unfortunate because mobile offers an opportunity for differentiation and if the leading sites aren’t fully ready. This holiday season it seems that the UK Retail sector as a whole isn’t meeting the expectations of the customers they serve. The home page seems to be optimized for the iPhone (right) as you’ll see the content modules cut off on the Android device (on left). It’s good that they have a search button at the top of the page but a key feature on the mobile site for any Brick & Mortar retailer is a Store Locator tool. This isn’t found on either screen. On the BlackBerry the M&S homepage site provides even less value. The large site downloads very slowly and the banner doesn’t seem appropriate for the screen. As you scroll down looking for additional functionality you also see navigation arrows cut off on the sides. Once we found the Store Locator we were able to find the closest store on most devices except the Android where the Find Nearest Store button did not work. Finally, we wanted to make sure that a shopper could successfully add a product to their basket. To celebrate the time of the year we selected Crackers and were able to add them to the basket on the iPad. 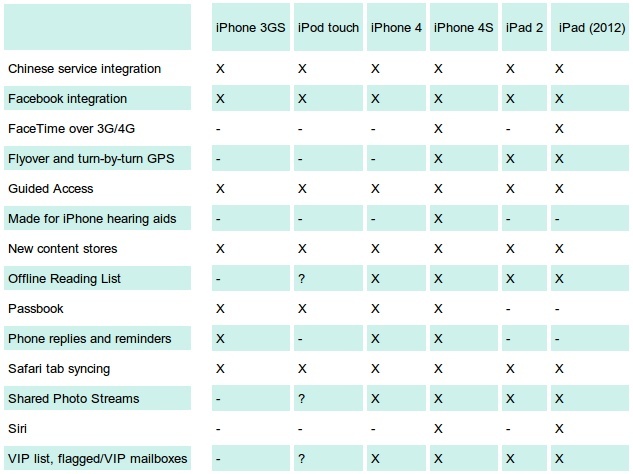 But Christmas crackers will not be on the wish list of smartphones shoppers…. The next website is certainly not optimized for the mobile user. It’s effectively useless on the BlackBerry and you’ll notice misaligned spacing on the Android device. The location button works on iOS (below left) but does not display properly BlackBerry (below right) or Android. We then went shopping on the Next site and quickly ran into issues. On the iPad the user gets the desktop version of the site. 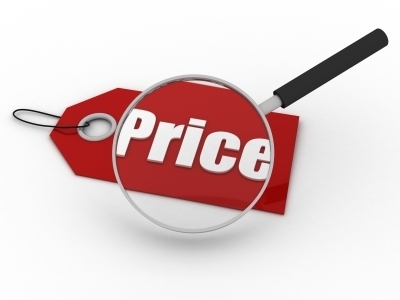 However that is only useful when hover lets the user see prices under the cursor. Hover functionality isn’t useful on a tablet so the page is not user friendly. Next’s problems didn’t end there. Seeing the Christmas section on the iPhone we noticed that the page did not render properly leaving a blank white space on the side of the screen. Worse yet, the Christmas navigation button failed to produce any results on the Android. We were able to successfully add socks to our basket on the iPhone, but on the Android when we selected size we were only given an option for color. Boots does a very good job at creating a web experience that’s appropriate for both tablet and smartphone users. 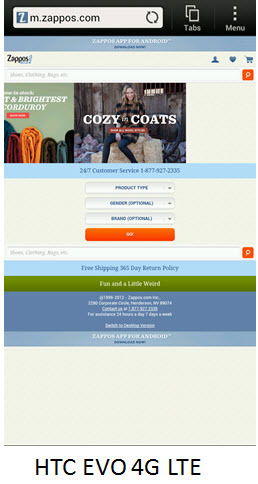 They have a good iPhone site with the Store Locator and Search prominent in a design lightened up for mobile. The navigation on the iPhone is mobile-friendly. Also, instead of promoting app as many sites do they promote desktop shortcut to website. 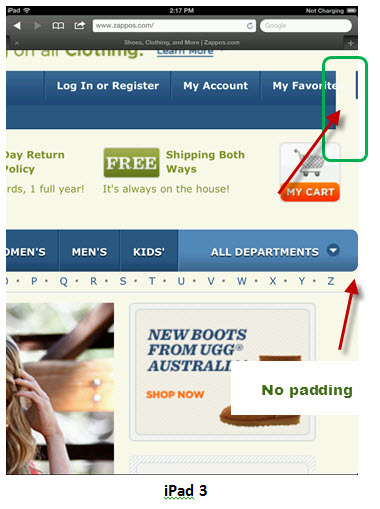 Many customers prefer the mobile web over apps for retail and Boots respects this navigation preference. While the home page image isn’t ideal for the BlackBerry—having search and store location prominent gives the basic tools that a user needs. Unfortunately the image failed to load for the Android device. When it comes to finding the store location—Boots was successful on all devices. While an image failed to load again on the Android while searching for product, we were able to add items to the cart on this and all other devices tested.The Boots retail site was one of the best tested. 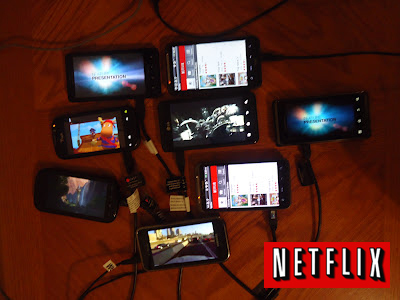 They were arguably a few Android tests away from truly hitting the mark. Firstly, John Lewis chooses to send tablet users to the desktop version of their site. This may make navigation a bit difficult without a mouse— but it isn’t necessarily a bad decision. 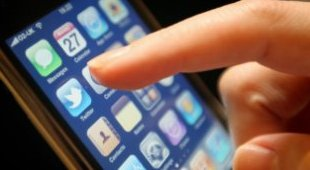 However it could lead to a slow download on slower mobile networks. John Lewis’s bigger problem is that the mobile sites do not share a consistent look and feel with the desktop version of the site. On the BlackBerry the home page delivers the user very little value. 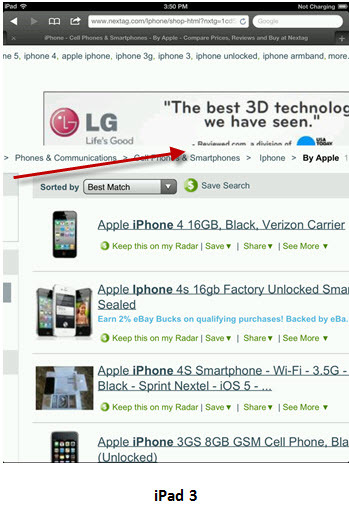 Their iPhone 4 site the basket and search are prominently featured (good) but store locator is not above the fold. Within the search bar the text is cut off. On the Android the search bar text is present… but so is a misplaced line above the logo cutting through the basket button. 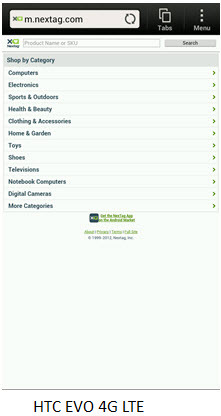 Once found, the store locator tool worked well across all devices. Hamper shopping on the iPad 3 produced was a user-friendly experience with plenty of product information and visuals. The basket updated properly. Searching for Hampers on the Android device produced some questionable results. Here we see an inconsistent background with grey fields highlighted by these boxes. The View More text is aligned to the top of the bar which is not consistent with display elsewhere on the site. Finally, lacking a Buy Now or Add to Cart link makes selecting these product more difficult. At product level we’re still missing an obvious means to add the hamper to the basket until you scroll down. Then you find a quantity drop down sitting lonely inside a box with a Buy Now Button featured a good distance away. The next product below seems to have the preferred presentation. Finally we looked at the TESCO website which was effectively scaled back for the mobile user and presented a Store Location button with clean light design for the smartphone shopper. A search option would be a good enhancement. But on the iPhone and BlackBerry the product categories are cut off making it apparent that they designed with the Android user in mind. Finally, when purchasing a hamper, we noticed that iPhone and Android devices both had same issues with misplaced question marks and run-on product description, but we were able to successfully add item to the basket. In the end it seemed that all UK Retailers studied would have benefited from additional mobile testing in preparation for the holiday season. Some issues found were egregious, while other seemed relatively minor. But one should note that none of these issues are considered acceptable for large, well-known websites and you’d be hard pressed to find similar mistakes made on desktop websites. The mobile web has some way to go to catch up to the quality standards set for online shopping and demanded by today’s consumers. Recently, in an article written by Rob Friedman of Apperian, he says “Enterprise IT developers have the same issue when building mobile apps for their fellow employees to use. Building and maintaining apps is expensive and it is only worthwhile if the apps are continually used. Some apps will be used infrequently but are still necessary, for example, when checking on company benefits. You don’t do it frequently, but you appreciate it when you do. Other apps are there to help improve your work life and if they are not compelling, then users will give up on them. For example, if you build a sales dashboard, it must be attractive, easy to use, and provide timely and useful information. If you get it right, your users will continue to return. If you make it difficult to use or fail to provide good information, users won’t come back to it. 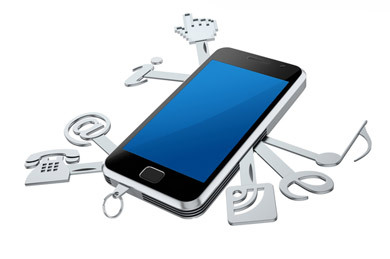 For enterprise mobile apps, security is particularly challenging. On PCs, security is a solved problem. As every laptop user knows, the corporate VPN is ubiquitous and identity is centrally managed. To access company resources, you must first connect and identify yourself. In many cases, you also use your secure key fob to provide an extra measure of identification. But on mobile apps, while these things are available, they feel very different and are not readily accepted by users. Starting a VPN every time you want to use a mobile app feels cumbersome and annoying, even though you don’t think twice about doing it on your laptop. 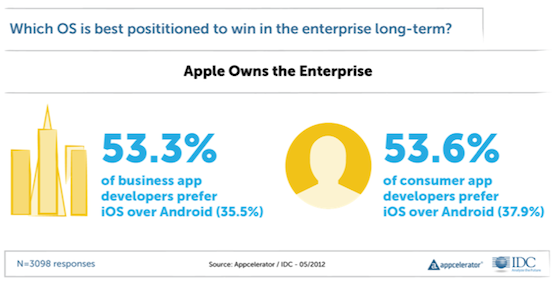 If enterprise IT views mobile devices merely as tiny computers, their apps are doomed to fail. 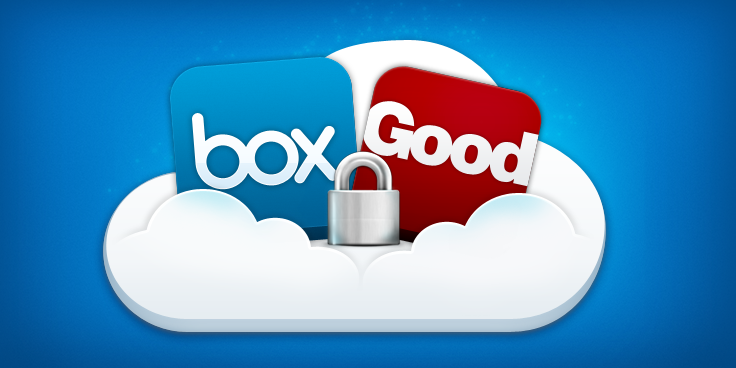 Fortunately, there are ways to have your apps be secured and yet feel usable. For example, you can use app wrapping to enable in-app VPN. Your users will have to authenticate to the app but they won’t have to figure out how to run a VPN on the device. You can also choose how long to remember a user for before they have to log in again. Security is always a tradeoff and relaxing policies just a little can make mobile apps feel much more usable. The holidays are a critical time for mobile. 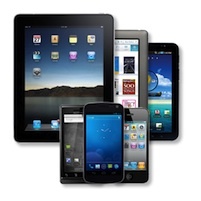 In a recent blog, Adobe predicts that sales from mobile devices will rise 110% to account for 21% of all online sales. Two-thirds of those mobile sales will come through tablets, and the other third through smartphones. Showrooming is the trend du jour in retail making mobile a big part of the brick and mortar experience. Big retailers should have prepared themselves for the onslaught of holiday shopping by now, but have they learned from mobile mistakes of the past? We did some research on how top retailers fared before the start of the shopping season from testing functionality, to visual effects, to maximizing the consumer experience. What we noticed is that with proper mobile testing, retailers could have made changes to their mobile sites to ensure positive and efficient mobile shopping experiences this holiday season. 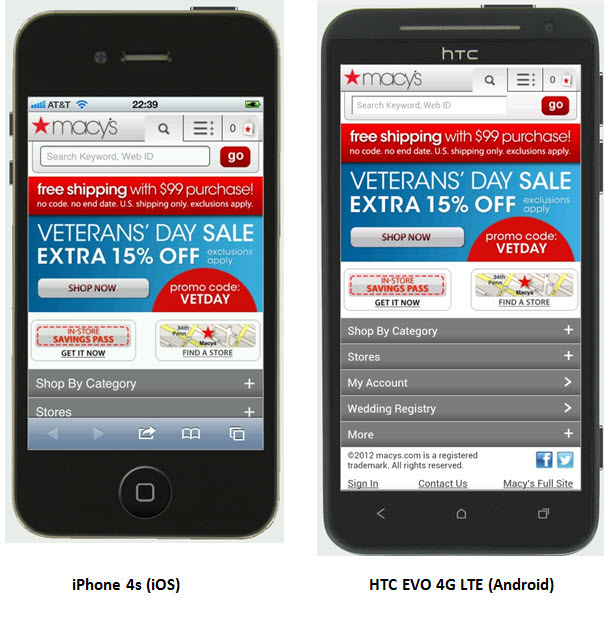 Macy’s – Optimizing for Android? It seems that Macy’s is optimizing their site for Android users. Comparing iPhone 4S to Android using the HTC EVO 4G LTE showed that font sizes differ on the devices with the larger screen Android having smaller fonts. The EVO appears to show a full screen while on Android Devices, the menu was only partially visible. In addition: The Macy’s site was not able to completely download on the BlackBerry Torch and was slower to load on the HTC Titan 2 (Windows OS). In addition to getting product information, it is critical that shoppers know where and when they can get their holiday gifts. We tested the Store Locator function and received a page that delivered expected location results. 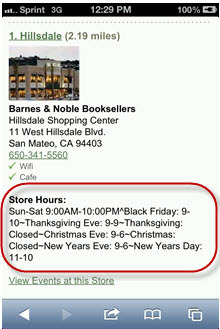 However the Store Hours section was presented very poorly making it difficult to read– and this poor presentation is consistent across all selected devices. 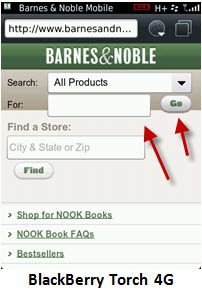 Barnes & Noble was able to download and render the same content on both the iPhone and iPhone 4S. We tested the home page on the BlackBerry Torch 4G and noticed issues with the Search For: box and “go” button straying from the background grey. The Torch store locator failed to produce any results. The HTC EVO 4G (Android) displayed the home page well but once the search was complete you could continue to search, but it was a bit difficult to determine with how to use the search field. Not bad… but not ideal. The HTC Titan 2 (Windows) also produced the correct store locator results. Here however, the search fields are completely blank and useless for anyone needing to continue their search. 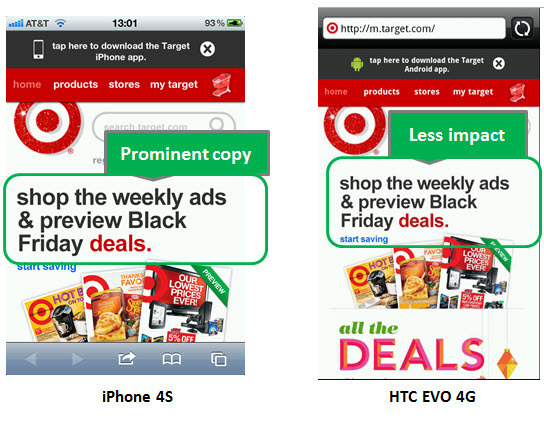 Target seems to be optimizing their mobile site for the iPhone homepage experience. The HTC EVO 4G (Android) and the HTC Titan 2 (Windows) frame the home page quite differently minimizing the impact of the title copy. We also looked at Target on the iPad 3 and see that they probably haven’t been testing on a tablet and are content to deliver their desktop site to a tablet on good faith. When comparing the desktop to the tablet there’s an entire column section feeding a skyscraper ad on the website that is a blank field on the tablet. 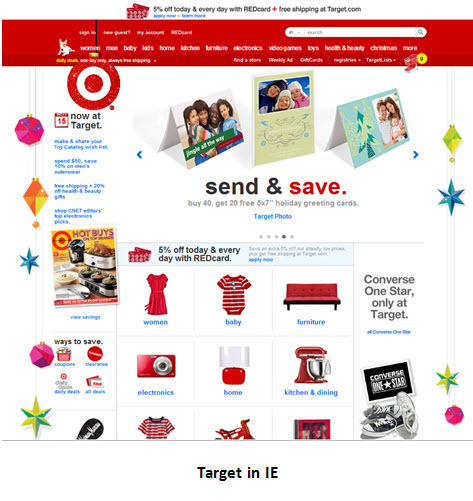 Finally, they’ve used the target “bullseye” logo as a holiday ornament on the website and tablet, a concept completely lost on the mobile devices. Finding a target near you? We tested the store locator feature and the “Use my current location” button did not work on any device. For the HTC Titan 2 the webpage send a message that the browser does not support geolocation. Search is an essential holiday function. 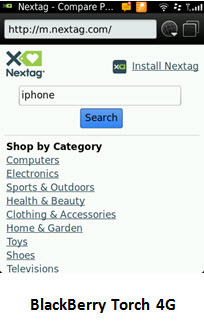 The Nextag mobile home page is quite simple yet it seems different with each device we selected. 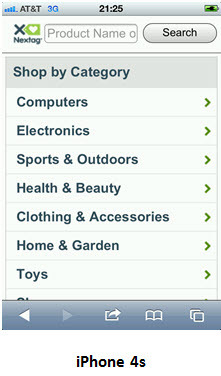 On the iPhone (and iPhone 4S) you can either shop by category or search. The instructions within the search field are cut off so you cannot read the entire line. We searched for “iPhone” and were able to display results for 3 or 12 items found. The Nextag home page on the BlackBerry Torch 4G seemed like an older WAP page with underlined links. We tried to search but the feature did not respond. On the HTC EVO 4G LTE (Android) the home page was much like the iPhone but the bottom 40% of the screen was not used. The search produced expected results but even then did not fill the entire page. The HTC Titan 2 (Windows) has a home page that was similar to the BlackBerry with underlined hyperlinks. This device produced expected results similar to the iPhone in a single color text, unlike the iOS models. Finally, the iPad 3 experience seemed just like FireFox and search produced expected results. However, we see that the banner add was cut off at the bottom making for poor presentation and displeasing any potential advertiser. 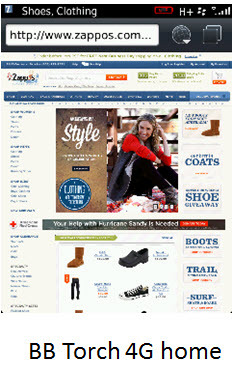 Finally we looked at the popular shoe site, Zappos. 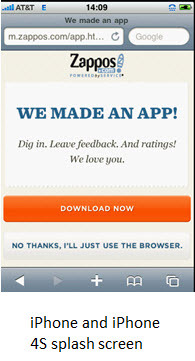 For the iPhone (1 & 4S) and iPad 3 users Zappos presents a splash screen promoting their app. 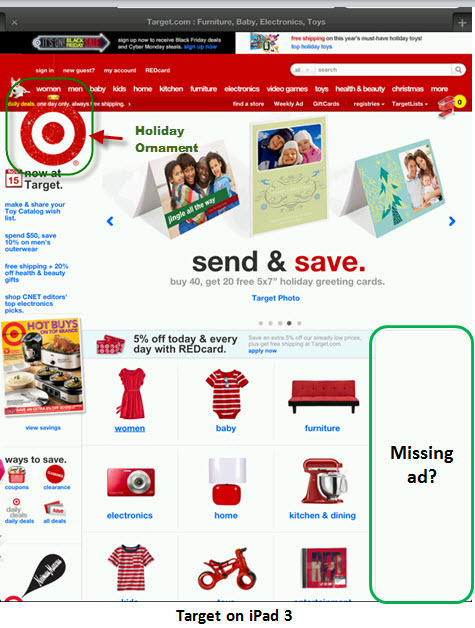 Users must navigate through the ad to get to the browser home page. BlackBerry Torch 4G users were sent to a desktop version of the homepage– text and objects far too small and unreadable to provide any value or continue further. HTC Titan 2 (Windows OS) users received a home page much like the iPhone users but without the splash page. There was a promo field at the top for the Android app. Zappos fared worst with the HTC EVO 4G (Android). The content delivered to the site was not sized correctly for the screen. Multiple banners in rotation at the top were viewable simultaneously while the activity buttons were limited to the center third of the screen. 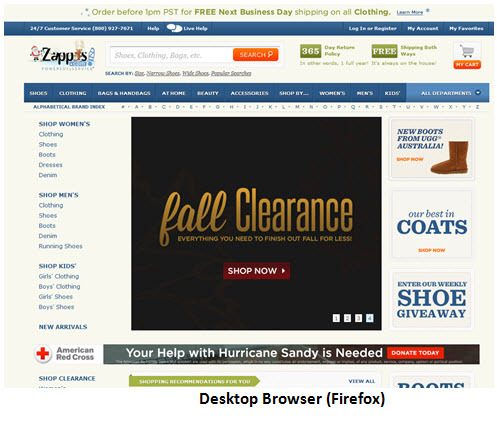 If tested, this is one error that Zappos would have caught. Last but not least, Zappos had an issue with rendering the top registration bar for the iPad 3, which is abruptly cut off only partially displaying “My Favorites”. The main navigation bar displays completely but lacks the few pixels of spacing needed on the right side of the page as found in a FireFox desktop browser. Early testing of both mobile websites in preparation for the holiday season would have prepared these top retailers for the judgmental mobile shopper this season. With holiday shopping looming and ready to begin in just days, it seems that these top retailers are already running into hurdles that may affect their holiday sales goals. mRetailers: Gear up for the upcoming holiday shopping season, now! 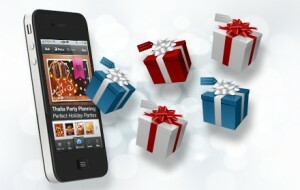 This holiday shopping season, retailers offering mobile apps have made a smart move. While nearly 86 million US consumers are already using smartphones to shop, this holiday season is set to see even higher numbers from mCommerce. From special QR codes to price matching via smartphones, retailers will rely on the latest technologies to deliver discounts right into the hands of shoppers. And while smartphones has been the only device most consumers carried in the past, they’re now armed with tablets that can provide an even more engaging shopping experience. As retailers offer apps that mimic flipping through physical mail-order catalogs and one-click purchasing options through merchants like PayPal and Google, the tablet is set to be the ultimate experience in holiday shopping this season. Eighty-two percent of tech-savvy mobile application users say there are major benefits to shopping on smartphones and tablets, according to new data issued by app technology provider Apigee. Bargain hunting reigns supreme: Half of respondents cite browsing for deals wherever they are among m-commerce’s biggest advantages, 48 percent name in-store pricing comparison opportunities, 38 percent point to opportunities to redeem digital coupons, and 27 percent cite the potential to earn in-app loyalty points. Mobile coupons and discount codes will continue to play a role in consumerism, especially around this time, when the cost of gifting can add up. Many retailers are planning to increase the number of deals, especially those through mobile coupons. And while consumers are expected to take their time to find the best possible price for the holiday wish list items, most savvy holiday shoppers will consult their smartphones for price-comparisons and the latest deals, wherever they may be. So, as a retailer who has extended its brand to the mobile channel, is your app or mobile website ready to handle the increase in traffic this holiday season? Keep in mind that one bug, glitch, crash or performance issue can immediately drive customers to shop at competing outlets. For mobile retailers, I suggest gearing up your mobile apps and websites for the upcoming holiday season NOW before it’s too late!